JUST REDUCED $10,000. A BEAUTIFUL 5.0 ACRES LOT IN COUNTRY PLACE SUBDIVISION, WITH VIEWS AND WOODED WITH MANY MATURE OAK TREES. VERY LEVEL USABLE LAND. GREAT LOCATION NEAR PGA GOLF VILLAGE. 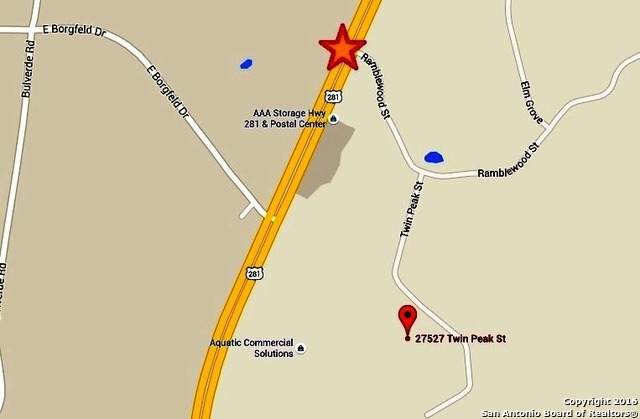 JUST MINUTES EASY ACCESS TO HIGHWAY 281, LOOP 1604 AND HIGHWAY 46. IT HAS ACCESS TO AMENITIES: POOL, TENNIS, VOLLEYBALL, CLUBHOUSE, BBQ AREA, PARTY ROOM, PLAY GROUND, GROUND MANAGEMENT. TANK & HORSE RIDING TRAILS THROUGHOUT SUBDIVISION. VA OR FHA FINANCING APPROVED. Listing provided courtesy of Nelson Karaklis of World Wide Realty, Llc.